When you wake up in the morning and the first thing on your agenda is to flush the poop upstairs and flush the pee downstairs that has been waiting on you aaaaalllll night. You think to yourself that you’d rather pull out all of your eyelashes one by one than hear ONE MORE WHINE! You hope someone will give you an ultimatum; eat this bug or make another kid’s lunch. You choose bug. You break a sweat, not doing yoga, but simply trying to get pants on your toddler. You scrape slime off your couch, your carpet, a comforter and when you think you’re done, you find that slime has stopped up the toilet. 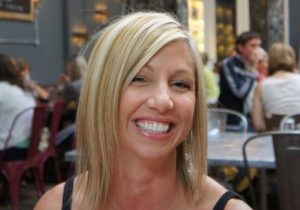 You haven’t talked to a friend in weeks, you haven’t gone out with your husband in months and you haven’t peed alone in…..you’re not even sure. Sheet pan meals are the latest craze and this is a fad I’m fired up about! Get it all done on one pan? Yes, please and thank you! Set oven to broil. Yes, broil. At first, I thought I would only succeed in charring my family’s dinner and setting the fire alarm off, but believe it or not things turned out perfectly! Wash, trim and halve brussels sprouts. Wash and remove center seeds from acorn squash with a spoon, then slice. 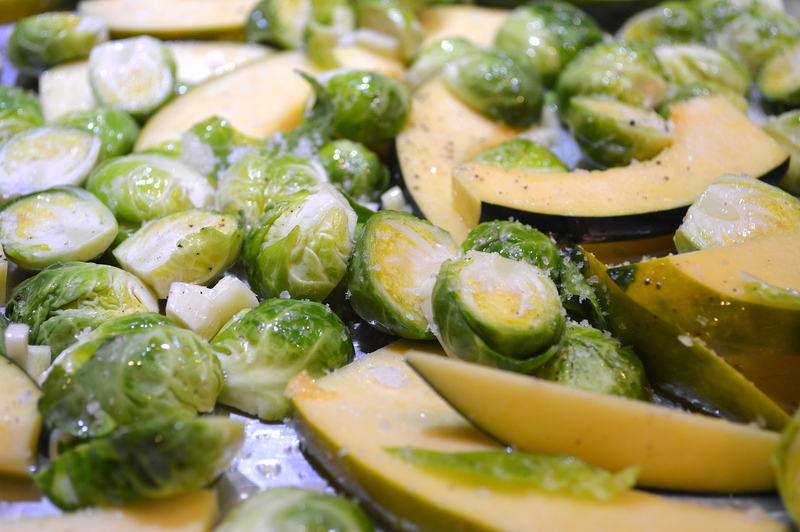 Place vegetables evenly onto a baking sheet, taking care not to overlap too much. Drizzle veggies liberally with extra virgin olive oil and toss to coat evenly. 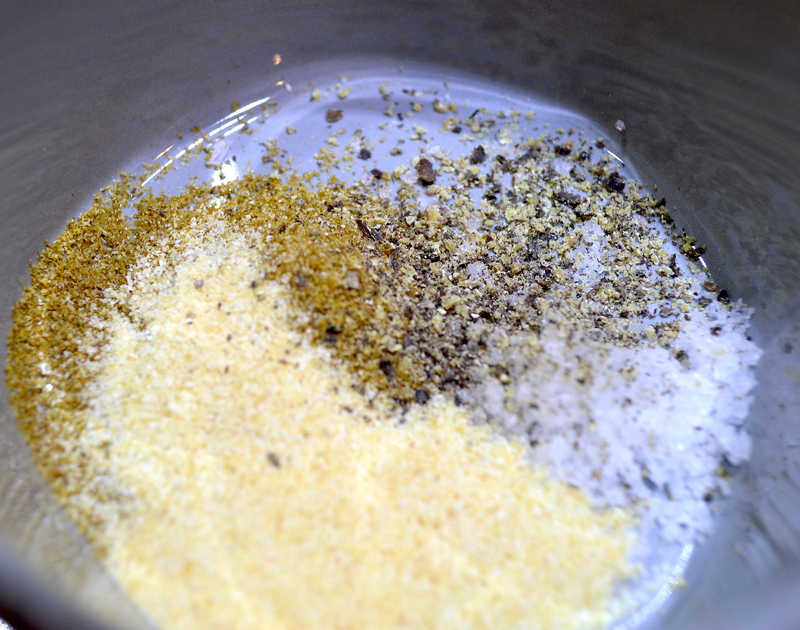 Sprinkle with large grain salt and freshly ground pepper. Combine 1/2 tsp ground cumin, 1/2 tsp garlic powder, 1/4 tsp chipotle powder (optional), 2 tsp salt and 1 tsp freshly ground pepper in a small bowl. Pat steaks dry with a paper towel. 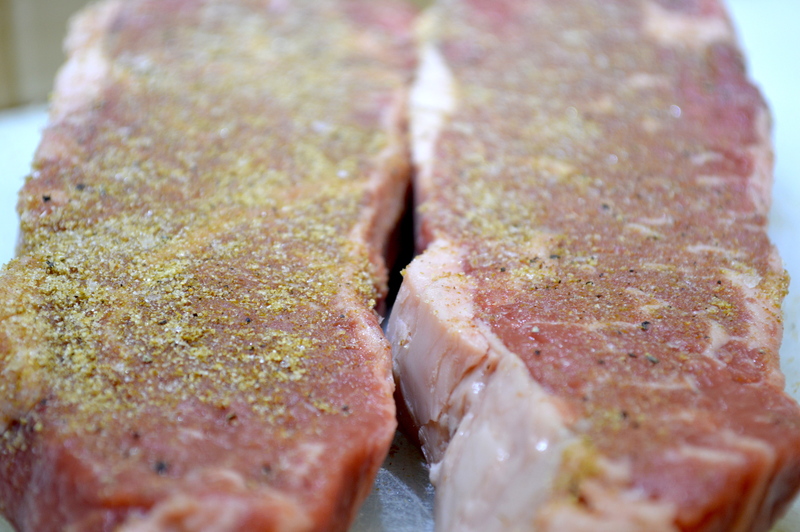 Rub spice combination over both sides of steaks. Place steaks onto sheet pan with veggies. Broil until steaks are browned, 8-10 minutes. 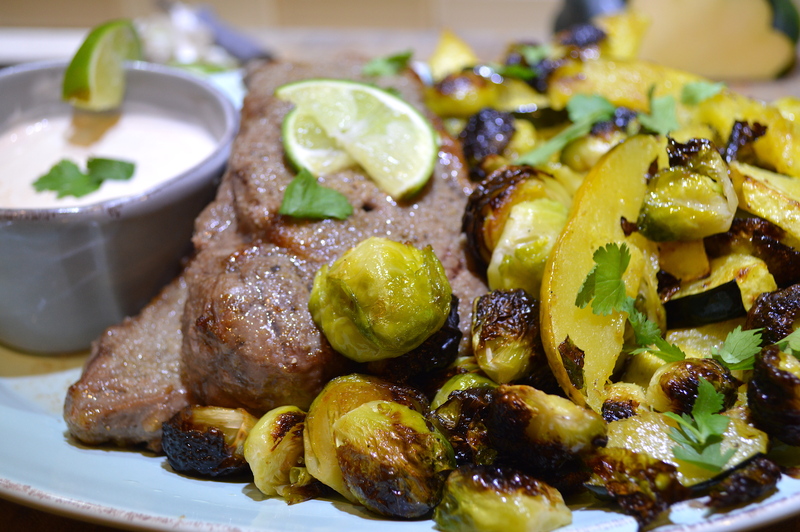 Flip steaks and turn vegetables, broiling for an additional 8-10 minutes. Remove pan from oven and place steaks onto a plate, allowing juices to reabsorb for 10 minutes before slicing. Place veggies back into oven for 3-5 minutes until fork-tender. 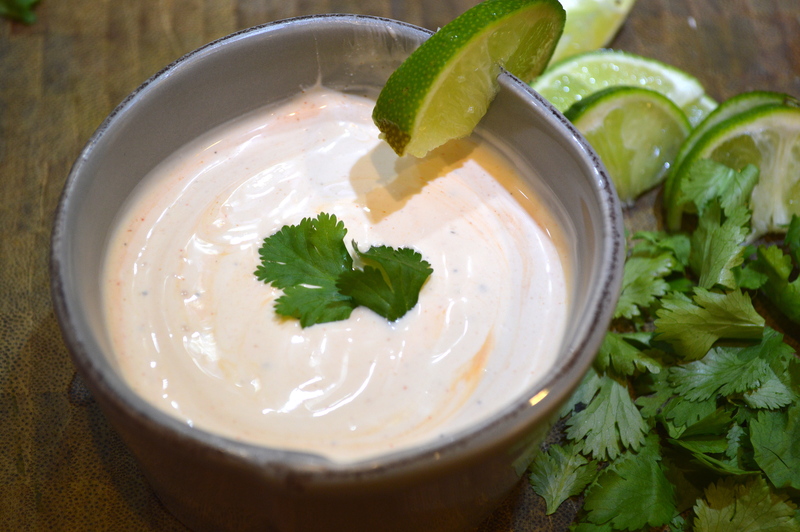 To make sauce, mix 1/3 cup mayonnaise, 1/3 cup low-fat sour cream and 1 Tbsp hot sauce in a small bowl. Season with salt and pepper to taste. Slice steak. Serve on a platter with veggies and sauce. Garnish with fresh cilantro and sliced limes. A dark sear on these steaks would look quite nice. For a caramelized color, heat oil in a cast iron skillet and sear each side until browned, 1-2 minutes on each side. You may want to reduce oven time slightly to ensure steaks don’t overcook. *Some research that shows but, has not proven with sufficient evidence that eating processed meats cause cancer. Many websites focus on red meat as the culprit, but all meats are processed. Vegetarian diets are low in cholesterol, total fat and saturated fat. I don’t eliminate meat from my diet but, I do try to include more vegetarian meals. Scroll down for the recipe you can print. 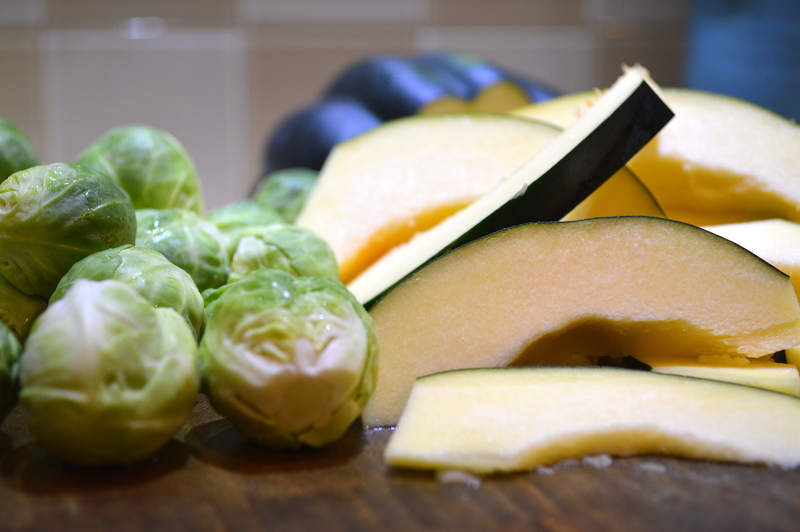 *something you may not know: like all winter squash, acorn squash is naturally sweet. 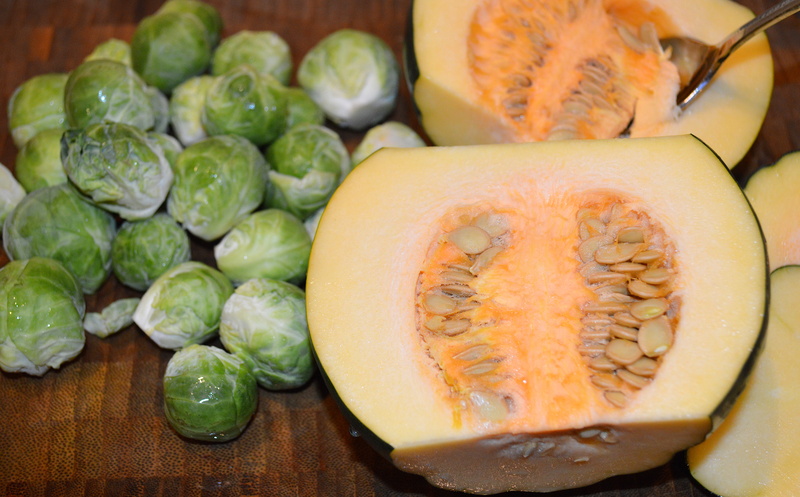 Packed with vitamin A and fiber as well as heart healthy carotenoids, adding squash to your winter menu is a healthy and tasty choice! <br /> <br /> <br /> <br /> If you feel overwhelmed by all the nutrition advice, calorie recommendations and diet trends, read these: Fact. Not Fad., Let’s Crunch Numbers!, Help Me To Help You! Thank you! Easy clean up too!